A supernatural horror thriller, End Of Days finds Arnold Schwarzenegger delving into unusually dark territory. The film is laden with over-the-top special effects, but nevertheless strangely compelling. 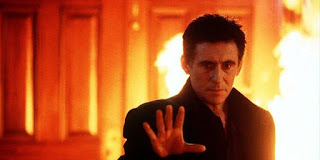 With midnight on December 31 1999 approaching, the spirit of the devil infiltrates the body of a nameless New York City investment banker (Gabriel Byrne). The devil's plan is to mate with a pre-ordained woman by the stroke of midnight to conceive satan's child and fulfill Biblical end of days prophecies. Christine York (Robin Tunney) is the 20 year old intended victim, and the Vatican has been searching for her since her birth. The Papal faction of the church wants to protect her, but the rogue Vatican Knights believe that she should be killed. Ex-cop Jericho Cane (Arnold Schwarzenegger) is a private security expert still grieving the murder of his wife and child. Along with his partner Bobby Chicago (Kevin Pollack), they think they are doing their jobs by foiling the murder of the banker by a deranged priest. Jericho investigates further and finds Christine unknowingly protected by satanists, awaiting the arrival of the mating hour. With Father Kovak (Rod Steiger) and the murderous Vatican Knights also looking for Christine and the devil closing in, Jericho has to find a way to protect the young woman from all threats while figuring out who can be trusted and sorting out his own demons. End Of Days is an extrapolation of Rosemary's Baby and The Omen for the Schwarzenegger international fanbase. After a two year hiatus, the action superstar returns and resets with one of his darkest outings, both in subject and style. As directed by Peter Hyams, End Of Days is frequently gloomy and brooding, with many scenes claustrophobically located in poorly-lit settings. The grim aesthetic is punctuated by over-the-top but still impressive supernatural special effect extravaganzas courtesy of the devil's antics. The Arnold super-sized action scenes are of the unnecessarily spectacular variety. What stands out most in End Of Days is that beyond the ridiculous premise, the film adopts a somber tone. The Bobby Chicago character wisecracks on the sidelines, but Arnold's Jericho is depressed and near suicide as the film starts, and then sucked into a battle with the devil himself, leaving no opportunity for irony or satire. By avoiding self-awareness the film demands to be treated seriously, and generally overcomes its own silliness with large doses of uncompromising violence. In the body of Gabriel Byrne, the devil is given a decent opportunity to make his case. And insofar as these who-should-be-in-charge-of-humanity debates go, a prolonged scene with the devil offering Jericho attractive inducements to side with him is much better that it needed to be. The exchange straddles the line between absurd and existential and lands just on the right side of explaining human propensity to sell out in favour of selfishness. And credit to Hyams, Schwarzenegger and screenwriter Andrew W. Marlowe for conjuring up and then sticking with a bittersweet ending. The special effects may consume most of the budget, but amidst the rampant destruction at the End Of Days happiness is found in a serene reunion.